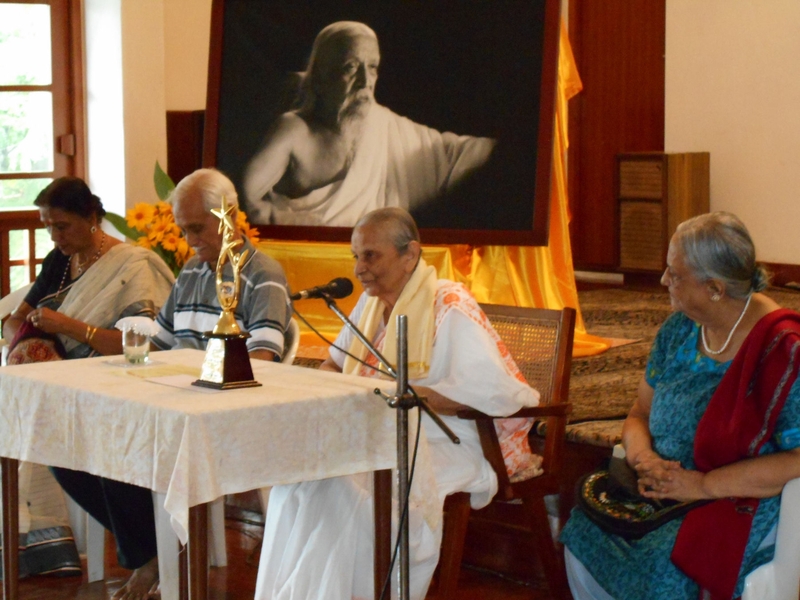 The fifth “Auro-Ratna Award” ceremony was held on Sunday, 28 December 2014 at the ‘Hall of Harmony’ in the Sri Aurobindo International Centre of Education, Pondicherry. As already mentioned, the recipient of the “Auro-Ratna Award” for 2014 was Smt. 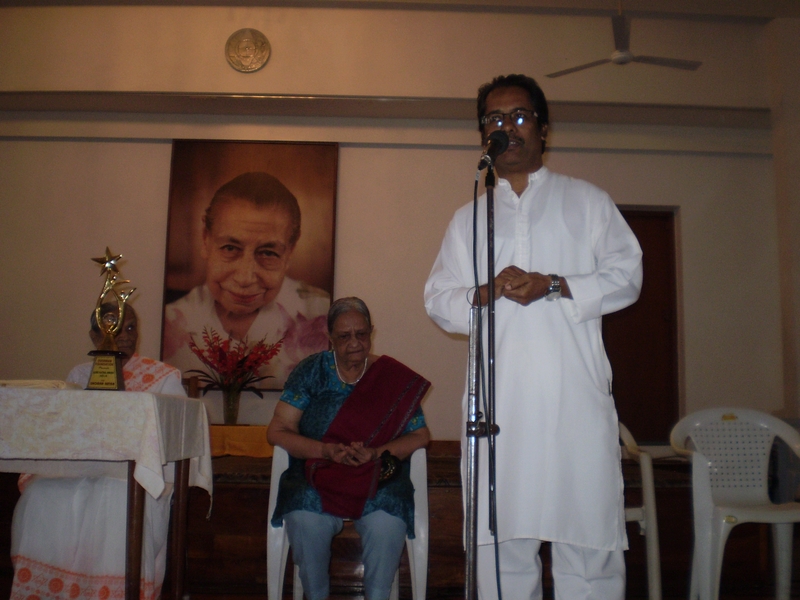 Shobha Mitra for her contribution in the field of music. 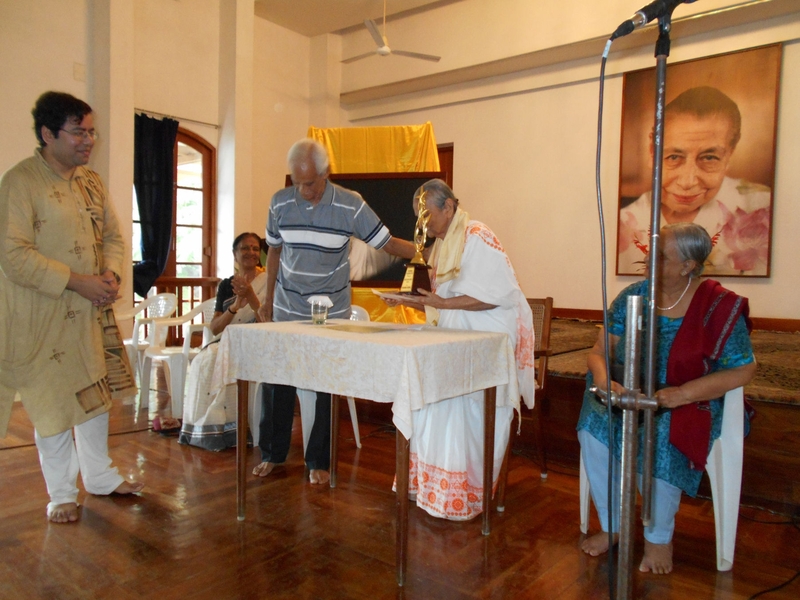 Sri Aurobindo Ashram, Pondicherry, had hosted the said award ceremony. Shri Manoj Dasgupta (Managing Trustee of Sri Aurobindo Ashram Trust and Registrar of Sri Aurobindo International Centre of Education), Shri Debranjan Chatterjee (Librarian, Sri Aurobindo Ashram Library), Shri Swadesh Chatterjee, senior professor at Sri Aurobindo International Centre of Education, Shri Swadhin Chatterjee, in-charge of Sri Aurobindo Ashram Press, Smt. 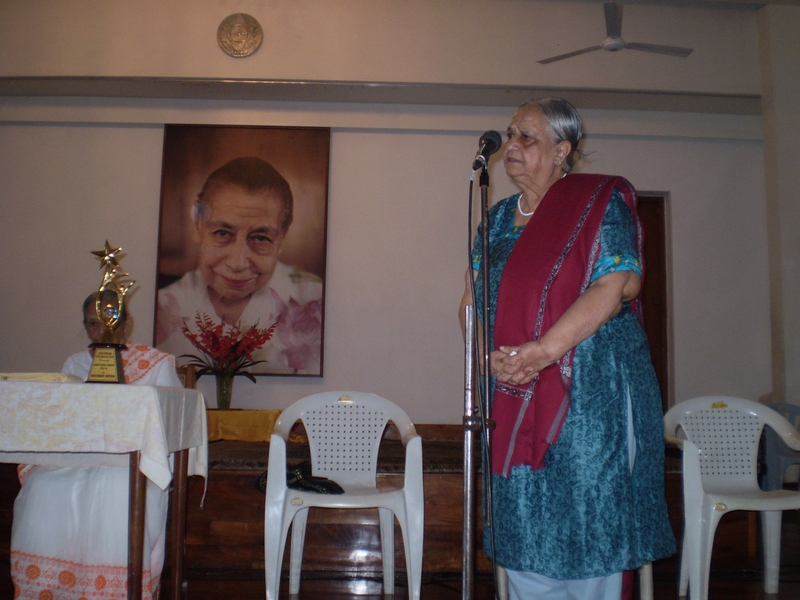 Krishna Chakravarti (senior member of Central Office of Sri Aurobindo Ashram and Board Member of Overman Foundation), Smt. 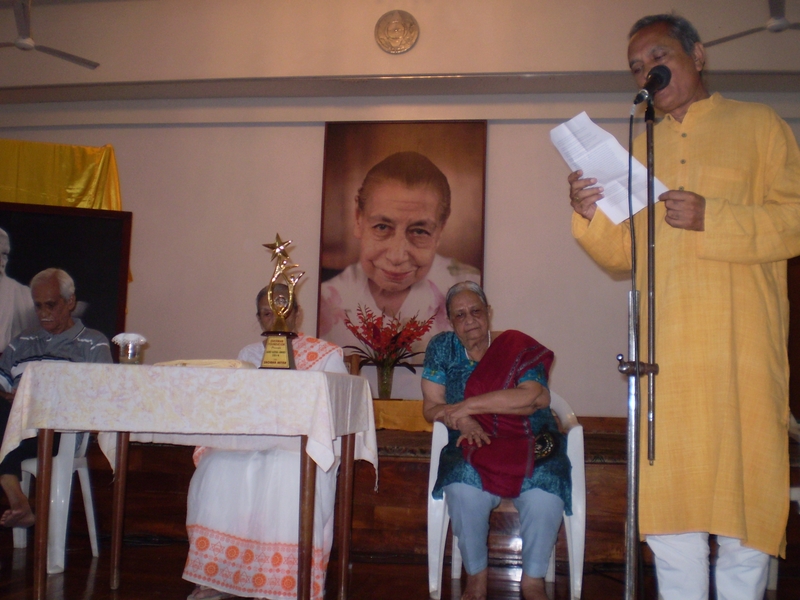 Ratna Chakravarti (teacher of music at Sri Aurobindo International Centre of Education), Shri Maurice Shukla (noted translator), Smt. Sumitra Cazade (daughter of the late Prithwi Singh Nahar and younger sister of Sujata Nahar), her husband Monsieur Bernard Cazade and Smt. 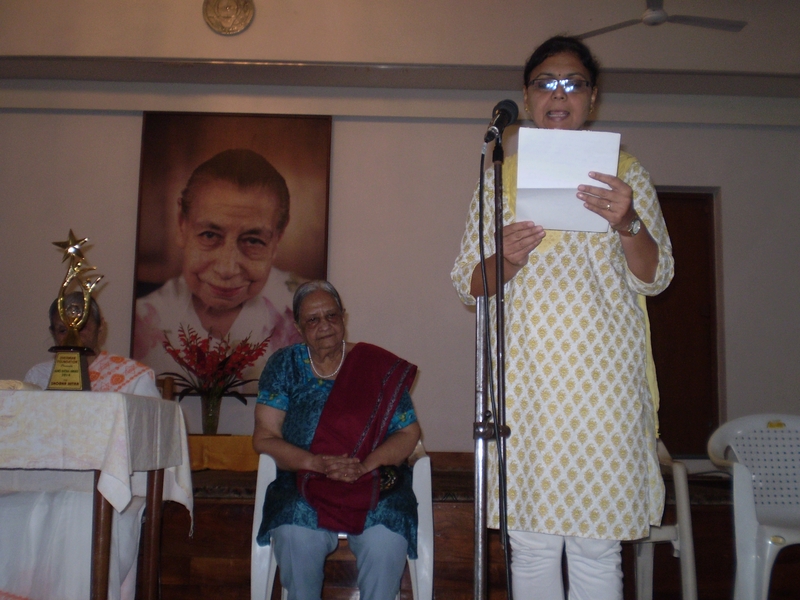 Deepshikha Reddy (Trustee, Sri Aurobindo Centre of Advanced Research) were among the innumerable guests who were present at the ‘Hall of Harmony’. Smt. Deepshika Reddy: “Occasion is Shobha-di. Oh my God! It really unnerves you. Our dear Anurag—you have told me to speak something on this occasion. Since I am not a speaker like Manoj-da who gets up and the flow just comes like that. I jotted down certain points, certain things, it will be a little boring for me to read those but don’t worry, just concentrate on the content. They are my feeling and my experiences of Shobha-di. “As Manoj-da said, I also wrote right in the beginning it is very difficult to say something about somebody you have been close to for the last more than four decades amongst us and I have been so close to her like many, many of us that… like in the Ashram you feel since we all are living close together, that we know each other, we know about each other but when it comes to Shobha-di I always felt that a part of her — somehow or the other — she didn’t let me know. Or maybe she didn’t let anyone know. Somewhere you knew her but still there was a bit that was veiled from us. Very sweet and tender, extremely friendly as she has always been, but several times, I and some other friends also felt that she was a little too strict or too rigid—if I can use the word—about certain things. ‘Perhaps it was not necessary’, we used to feel—you know—we have known her since we were in our early years. But then, as Anurag said, her book when in 2012 Mayer Divya Sannidhye and I was so fortunate she gave me the book and when you go through the book, it was only then that the secret—as I said her personality was a bit shrouded in mystery for me—a part of her personality—that kind of got revealed after you read the book. “Everybody always obeyed her, we all did; all her instructions and advice with deep respect and love. Such has been her a kind of awe-inspiring personality—very firm and steady from within even though she has been so petite and delicate in frame. But questions were still there. In her life, after reading that book we understood—I understood for myself—perhaps she never ever did anything without the permission or the guidance of the Mother. It had been a lifelong guidance for each and every small and big, serious or non-serious, spiritual or mundane, intense or ordinary, every thought and feeling, every emotional sentiment was put before the Mother. It was then that I understood why she did not like or encourage certain kind of music because Mother did not like those. How to conduct the little nitty-gritties, how to conduct rehearsals, programmes, strict discipline with intense aspiration, day after day, how she tuned herself to the Mother’s guidance is most fascinating to read the account, almost a daily or weekly written record so authentic and original that it really touches us most profoundly. How the Mother taught her to expand her consciousness, to become more receptive, to exercise her will and inner determination including how to bear physical suffering and illness etc. We learn Mother’s ways of dealing with us. You know that Bengali song—amar hath dhore tumi niye cholo sokha, ami je path janina. This was Shobha-di’s intimacy with the Mother who indeed led by her finger. “She was chosen or just now as Anurag mentioned—as an instrument to set up the Music Section in the Ashram and her journey of yoga was to be through music only. This was not easy to say the least. It was an arduous task that needed a deep surrender. How she was given the necessary strength and how the Mother prepared her—I would rather say chiseled her inch-by-inch with Her grace is an incredible story of high sincerity and surrender. These accounts are our invaluable treasures. Before Shobha-di, Manoj-da’s didi Priti-di’s book totally inundated us. I am sure all of us have read it. With the Mother’s grace and Her immeasurable love for her children, these books do not speak of any philosophy or psychology; they project our individual sweet Mother of Love as She was one among us—the mortal ones. These books make us feel Her tangible presence when we read them. Many have told me after reading Priti-di’s book and two persons have also told me recently after reading Shobha-di’s book that their very relationship with the Mother had changed. Mother became so much more intimate to them only after reading Priti-di’s book and later Shobha-di’s. How many times we have cried and wondered and closed the book and felt Her presence so close to us. What else we are here for? Only to experience this, isn’t it? Shobha-di, my deep gratitude to you for your precious contribution to posterity. “Among the many ways that Shobha-di was graced as we know from her multi-faceted experiences—little bit our Anurag has already traced out—what not she did? She was a painter, she was a wonderful calligrapher, she was, of course, as a musician—we know—a wonderful composer from dance-drama to orchestration—what not she has done! When you read the book then you get to know all of it. I don’t need to say, those of you who haven’t must read. Perhaps the first prints are over, I think, the second prints are yet to come but I think it is absolutely a must. “One of the abilities that was opened in her or revealed to her was the ability to compose or write perhaps the original scores in Hindustani ragas. She did not know anything about it. In fact when she was teaching music, when she was given the Music Section, when all her songs were finished, whatever she knew, her stock of music was finished, one day she went and told the Mother that what am I to do now? Then the Mother said: “Well, you create your own music.” She said: “I don’t know much. I have never done that. So?” And well, we don’t know what Mother gives to whom at what time but the midas touch was put in to her or given to her. And that particular fine day, after the Mother told her she was put in contact with the world of Sur or Shruti. Waves after waves of Sur started invading her being, bursting forth from her, as if she did not know how to contain them. Such was the grace of the Mother! “‘Music is the language of the soul’, says the Mother. Every year Shobha-di made us students of vocal music, write this quotation on the 1st page of our note book. These were not mere words but living seeds planted by Shobha-di in us at the tender age of 12, by the example she is, by the loving guidance she gave and continues to give—stressing always to go beyond skill and talent to express that something from deep within and offer it to the Divine. 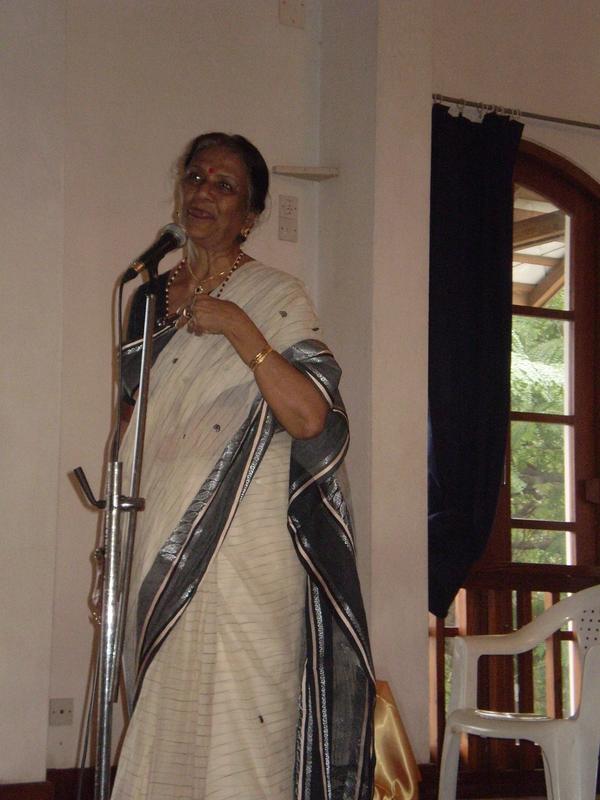 “As teenagers we had the privilege of having Shobha-di as our teacher for vocal music for 10 years. Though she tried to appoint other teachers for us, we insisted on learning from her alone, and we managed to do so. “As young adults we were fortunate to participate in most of her musical compositions which express her ardent aspiration to the Lord and the Mother. And even today our musical journey continues under her guidance. For Shobha-di, at no point of time has it been music for music sake alone. It has always, at every step been music—as an offering of oneself to the Divine. Music—as an expression of the divinity within. “How blessed we feel to have been nurtured under such an inspiring example. It has been an influence not only in the field of music but in life itself. “Namaskar. First of all I congratulate both Mr. Anurag as well as Shobha-di for this wonderful occasion which has been created because of dedicated work of decades. It does not happen in a day. When I was asked to speak here, to say a few words, I knew that there will be smarter people before me and am not smart enough. A few points that I had noted have been already talked about rather extensively even before I came here. So I’m really scratching my head what to say. So what I decided at the last moment as I was listening to Shilpa and Deepshikha-di—particularly Deepshikha-di who gave me some time to think—is that I would rather share a few personal contracts with Shobha-di. “First of all, I never thought that I would have to come to the stage one day for a programme related to Shobha-di where I would neither be playing the table nor singing. But I am extremely happy that this is happening. “I started playing the tabla for Shobha-di’s programmes since I was rather young and I had this bad habit of always coming on time for rehearsals and then get extremely irritated when others came late. So Shobha-di was so well-organized; she never really forgot the individuals’ strengths and weaknesses either. So at the end of a day’s practice, she would announce that tomorrow’s practice at such and such place at 7.30, “Munna, tumi 7.45 e esho [Munna, you come at 7.45].” (laughter) I will never forget that because it just not showed what I was; it showed more of what she was. You know, she took care of these little things, strengths and weaknesses as I put it which finally helped the organization which avoided the irritation in the tabla player, etc. “The second thing which I remember about Shobha-di is that her openness to all kinds of music. When Anurag said that she did a programme which had twenty-five languages, that did not surprise me at the least. When I came to the Ashram I was already 12; because of some amount of music in my family, I was already exposed to quite a bit of music but it was mainly Oriya music. And there were not many people at that time probably who really did music in Oriya. 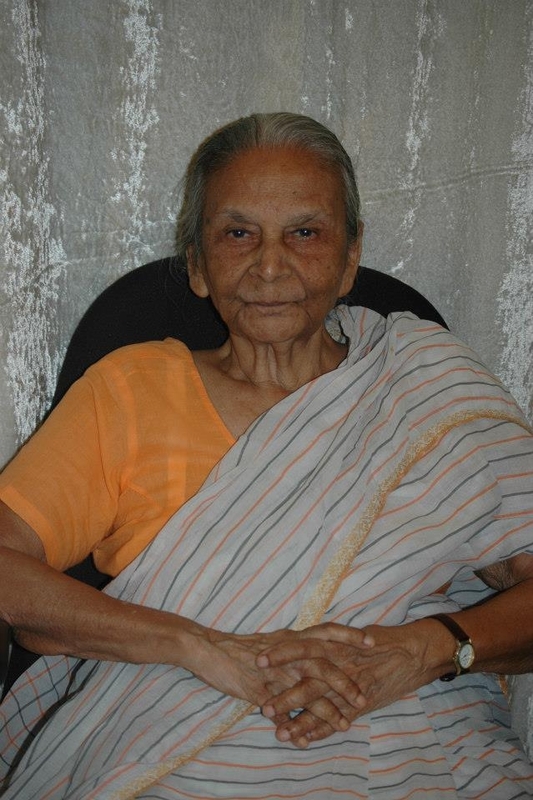 And she would always encourage me to sing Oriya songs in programmes or to prepare Oriya chorus in which the others would join in just to show another facet that she was always open for newer — both vertically and horizontally — as far as music and songs were concerned. “Just as I was coming in, somebody told me that in order to make a speech immortal, one had to make it everlasting. So last night I had already noted something because I stand here as a stop-gap. I am replacing somebody who was supposed to come but who could not or who probably played a bad prank on me. “I am here this morning before you neither as a musician nor as a singer, not even as a writer. I am here as a grateful witness. A witness of the Mother and Sri Aurobindo’s Grace over an event that is directly linked with Shobha-di. And I think the setting too is appropriate to share this event with you today. “The event I am referring to was the installation of Sri Aurobindo’s statue at the Unesco headquarters in Paris on 16th September 2009. Quite naturally I was deeply moved to be among the four privileged persons selected by Shobha-di to take her composition to Unesco for this occasion. The Indian Council of Cultural Relations, Government of India, had approached Manoj-da for something with which to mark this extraordinarily symbolic event. And The Ashram requested Shobha-di to come up with something appropriate. “So we got down in earnest to help Shobha-di in whichever way we could. She began with the selection of Sanskrit hymns and mantras that were to accompany her musical composition. Shobha-di’s musical composition began emerging gently as she wove around it Vedic hymns, shlokas from the Gita and the Upanishads along with some significant extracts in both English and French from Sri Aurobindo and the Mother. She had accepted the challenge first with a lot of trepidation but always with such grace and humility that the composition began taking wing. This was the first time that Shobha-di was composing for such a diverse international audience. Towards a Luminous Future was her name for this offering and it emerged as a 30 ­minute composition in her distinctively experimental style of music that sought to transcend the traditional Eastern and Western modes of expression in order to touch a space that was universal and common to all of us and which lovers of music from anywhere could resonate to. “Our rehearsals became moments of intense joy outer dedication in Shobha-di’s wonderful presence and the four of us, Anurupa, Harinarayan, Joy (from Auroville) and myself, endeavoured to find that inner space of ‘oneness’ and truth in order to communicate what we had to convey for this exceptional occasion with a happy and effective inner conviction. “As a biographical note on Sri Aurobindo was also to be distributed to this diverse audience at Unesco in Paris, Cristof and myself decided to put our hearts and heads together to prepare it. 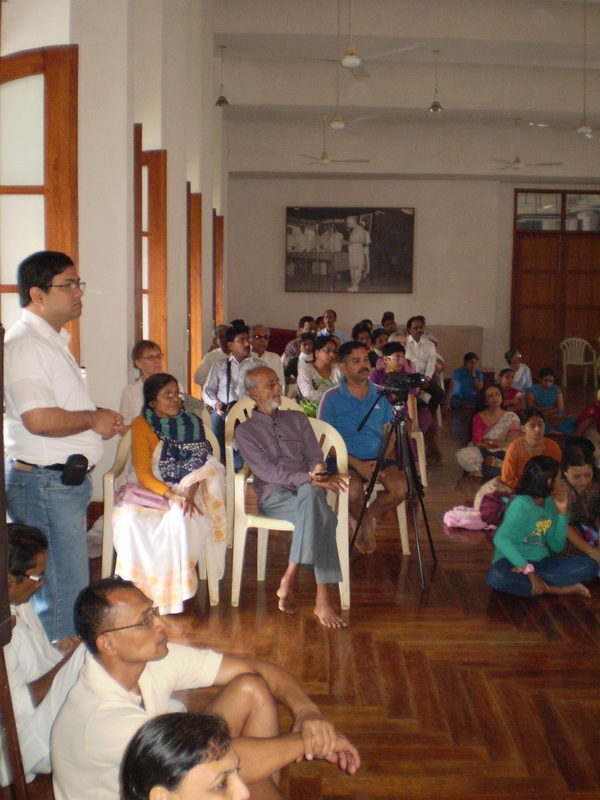 The novelty of the task lay in presenting Sri Aurobindo to people who were not disciples or devotees and we were more than happy to take up the challenge. Right from the word ‘go’ there was that enthusing feeling of joyful service and flawless harmony between all of us and I personally felt inwardly uplifted as we worked on this very special ‘mission’ that had been assigned to us in total trust. And at every step Their Grace shone through: the way things organised themselves, the way all kinds of difficulties were overcome with help and understanding from Manoj-da, from the Trustees, from everyone around. “Towards a Luminous Future was a unique achievement because Shobha-di had managed to get Sri Aurobindo and the Mother’s Vision and Consciousness across so powerfully without ever mentioning Them by name, and thus this whole ‘religious propaganda’ quicksand was marvelously side-stepped. I’m sure this was something that the Master would have heartily approved specially considering the kind of audience this offering was addressed to. “Our rehearsals happened both in the Ashram and Auroville at the Bharat Niwas which again for me personally was quite symbolic. Jean, the Auroville sound and light in-charge and one of our former teachers at the Sri Aurobindo International Centre of Education, helped us with these technical arrangements. And then as we were nearing D-day, another miracle occurred. Just as we finished burning the master CD of Shobha-di’s music on the evening of 9th September, the entire power system burnt out in the recording studio! Everything disappeared from the computer but Shobha-di’s musical score had successfully slipped out onto the master CD! “The biographical note on Sri Aurobindo and the accompanying text of the musical composition were printed at our Press and these too turned out beautifully in their conciseness and simple elegance. “As the day of departure for Paris neared, we felt more and more conscious that the Mother had deputed us as Her little ambassadors to Unesco. 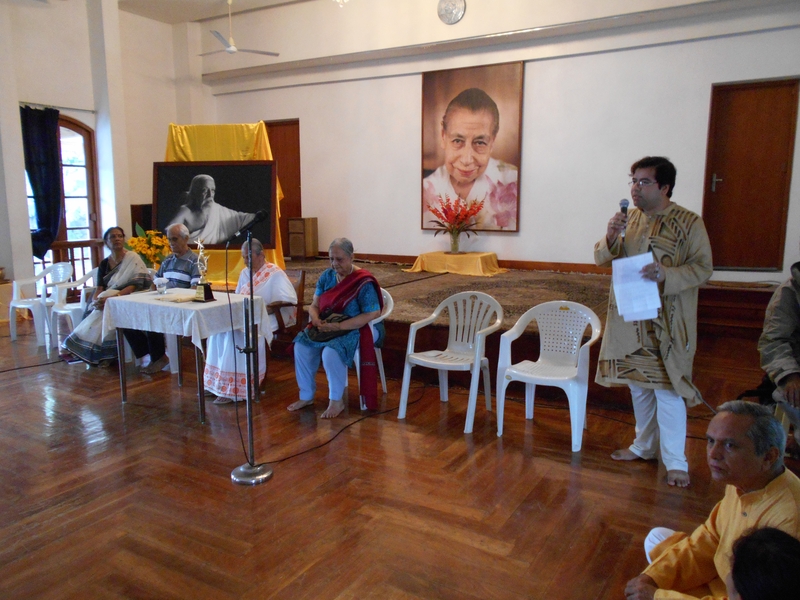 We were taking Sri Aurobindo to the Mother’s city of birth! What an enormous privilege and responsibility this was at the same time! “Everything kept unfolding in such amazing fluency and naturalness that Their Presence became more and more palpable and our gratitude for that Presence more and more intense! “In Paris, we were received by our friends with such warmth and hospitality and the home we stayed in was big and beautiful and large enough for us to remain in that state of inward receptivity. We were able to practice our ‘offering’ every day in this house in the most wonderful of mood and atmosphere. When we were not rehearsing or sharing with our friends eager to know about our life at the Ashram under the loving care of the Mother, we went to visit places that were connected with the Mother’s life in Paris and around. And on the eve of the programme, I took my team to the basilica (or church) of Sacré-Cœur (which means sacred heart) on top of a little hill called Montmartre. Here, I need to tell you a little story. “One of the Mother’s young boys had left the Ashram in 1961 to go to Germany to study sports medicine. After spending some time there, this person was so overcome by a bout of home-sickness and an irresistible longing for the Mother that he sent an SOS to The Mother asking desperately for permission to return to the Ashram. The Mother replied at once, and advised him to go to Sacré-Cœur in Paris. Quite significantly this basilica had opened in 1914, the very year that the Mother left France to come to see Sri Aurobindo for the first time. On receiving the Mother’s letter, this gentleman boarded a train for Paris and reached the mount overlooking the city. As he entered the vicinity of the Sacré-Cœur , he suddenly felt as if he was enveloped in the Mother’s warm physical embrace. That sense of home-sickness that had been eating into his heart magically faded away and in her comforting Presence he regained his old enthusiasm and inner joy. Now this very same gentleman came all the way from Italy to Paris to witness the event of the installation of the statue of Sri Aurobindo. And it was after listening to his story over lunch one day that I decided we should all go to the Sacré-Cœur on the eve of the event. And quietly we arrived there, sat there for some time and tried to bring Her into our being in that light happy air almost as if we were paying homage to Her Presence there. “Then 16th September dawned. I woke up feeling exactly as I used to on the day when I would go to see the Mother on my birthday. There was a kind of feeling of a ‘Darshan’. Trying to remain in that state of concentration, unfortunately we skipped the installation ceremony of Sri Aurobindo’s statue and went straight to the auditorium where the musical offering was to take place. “A very large crowd had gathered in the vast auditorium: Unesco dignitaries, diplomats, intellectuals who did not know much about Sri Aurobindo, writers, artists, simple French friends and admirers of India and a good number of disciples and former students. The lights in the audience faded and the spots on the large stage came on. 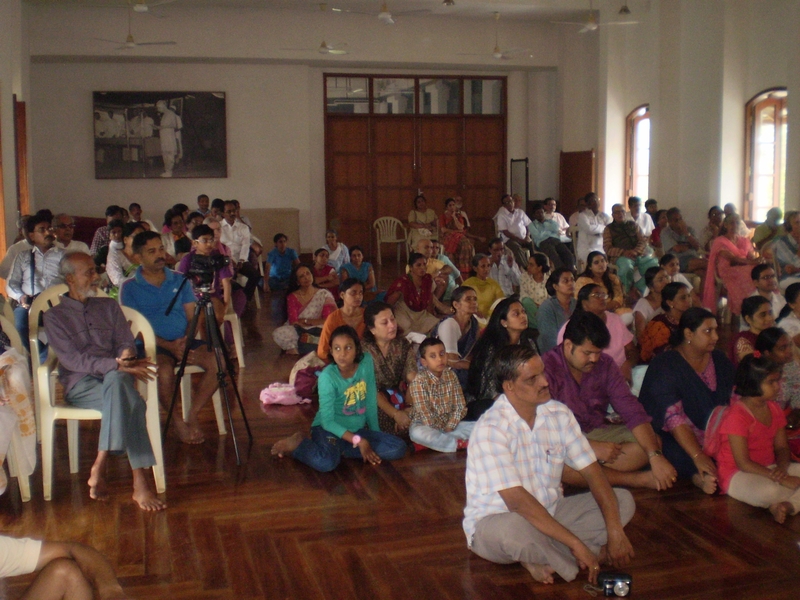 We felt as if our prayerful hearts and bodies were being uplifted in Their Presence as the deeply moving organ-chords of Shobha-di’s music filled the hall and the powerful words of the Mother and Sri Aurobindo reverberated in the air. And then as the last notes of Sunil-da’s 1972 music faded into a palpable soul-stirred silence, the air felt charged with that fragrance of the New Consciousness that Sri Aurobindo had striven all his life to bring down. For a few minutes at least, we the participants and the audience were granted the priceless joy of getting a whiff of that “luminous future”. “Infinite gratitude filled our unbelieving hearts. After Shri Maurice Shukla’s speech, Shri Anurag Banerjee invited Shri Manoj Dasgupta and Smt. 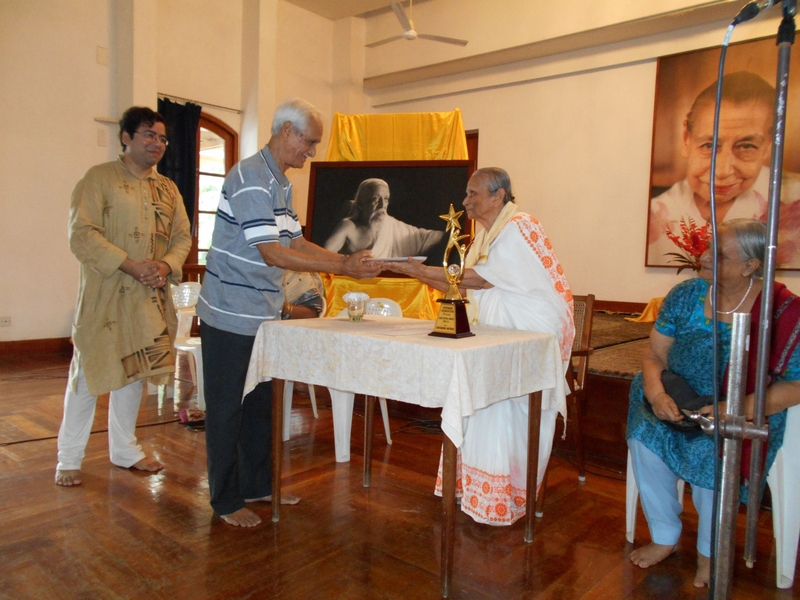 Krishna Chakravarti to felicitate Smt. Shobha Mitra. Smt. 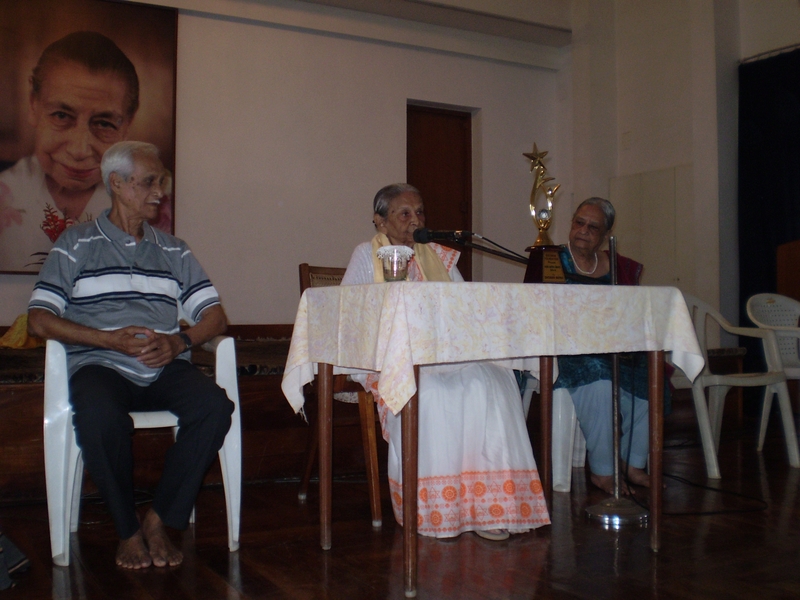 Krishna Chakravarti presented Smt. 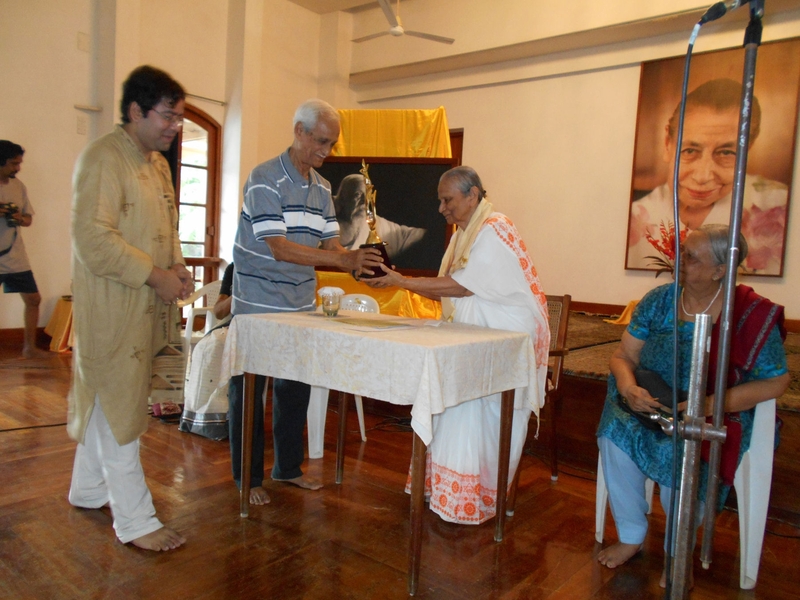 Shobha Mitra with the angavasram while the certificate and the trophy of the “Auro-Ratna Award” were presented to her by Shri Manoj Dasgupta. The ceremony was concluded with the aforementioned recorded music in the voices of Smt. Ratna Chakravarti and Shri Uttam Ganguly. Exceedingly glad to know this. Auro Ratna in the true sense of word Shobha di. “Sri Aurobindo’s Presence established as the Statue-Symbol with the Shobhadi’s music ““Towards a Luminous Future” at UNESCO headquarters seems to lead the World-Governments towards future world political order that Sri Aurobindo has expected to materialise in future in His book Ideal of Human Unity: Vetoless UNO, etc. Recently The President of France is reported to have said that at least in the matters regarding terrorism Veto must be barred for use in the Security Council. Shobhadi’s universal music has eternalised it seems there. Thanks to Shobhadi and the group that carried and delivered her composition to the international audience. Now, let me express a wish of mine which I have been talking to our people: Can we make a move to establish “The Mother and Sri Aurobindo’s Symbolic Presence in the house where “Bal-Jagadamba” lived in Her childhood. Can the house be acquired and “The Mother and Sri Aurobindo’s Bhavan” be created in Paris. We must remember Sri Aurobindo used to visit The Mother to guide Her, the Divine Rendezvous. 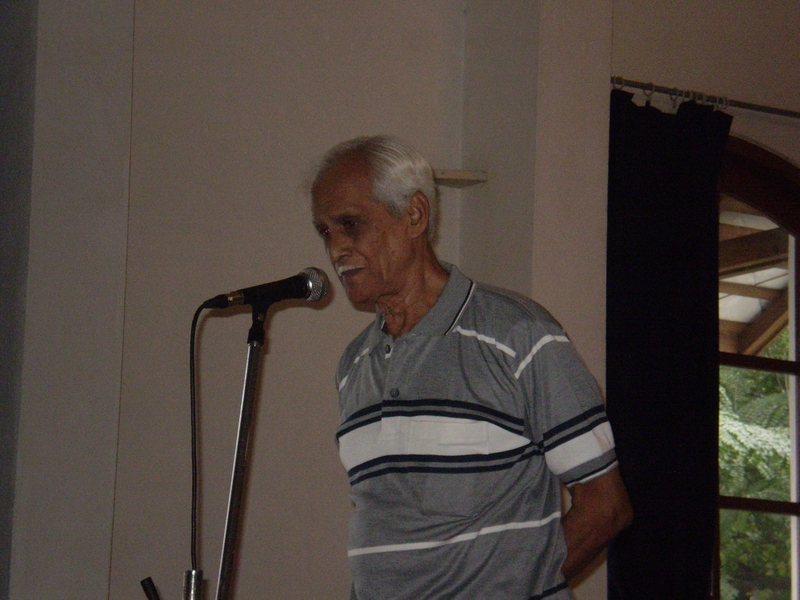 Dear Anurag,excellent and musical report on Auro Ratna Award2014. “It was more than forty five years ago that I first met Shobha-di, and that was also the time when I was initiated to music. Let me make it clear at the very outset that I am really not qualified to judge or analyse Shobha-di’s music or for that matter her journey in life. To me she was simply my music teacher and the one who initiated me to music. All I can say is that her music gives mea lot of peace and tranquility and has also helped me to remember the Mother and Sri Aurobindo even after thirty five years of living in this hostile and dark world.